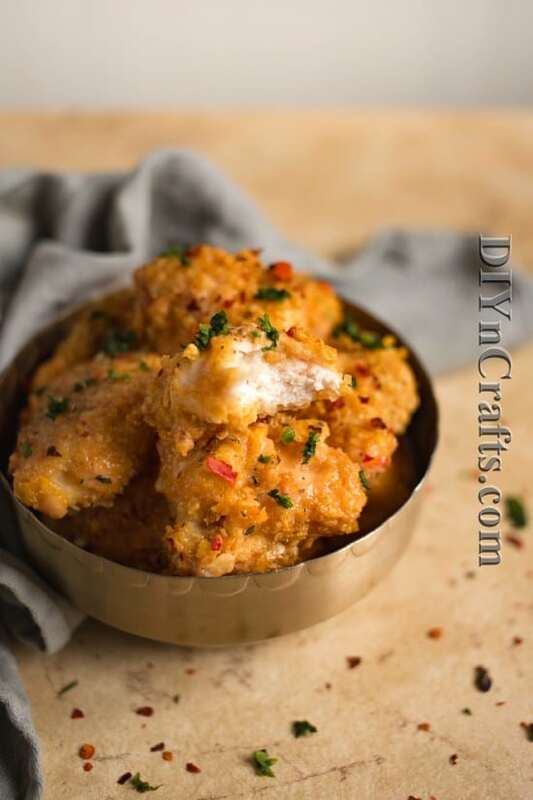 Home » Food » Recipes » This Easy To Make Bang Bang Chicken Is The Bomb! This Easy To Make Bang Bang Chicken Is The Bomb! I have to admit, I had never tried Bang Bang Chicken before this recipe and I couldn’t believe what I had been missing. My friends would always ask about it but I never knew how to make it. I am so glad that I stumbled across this recipe. 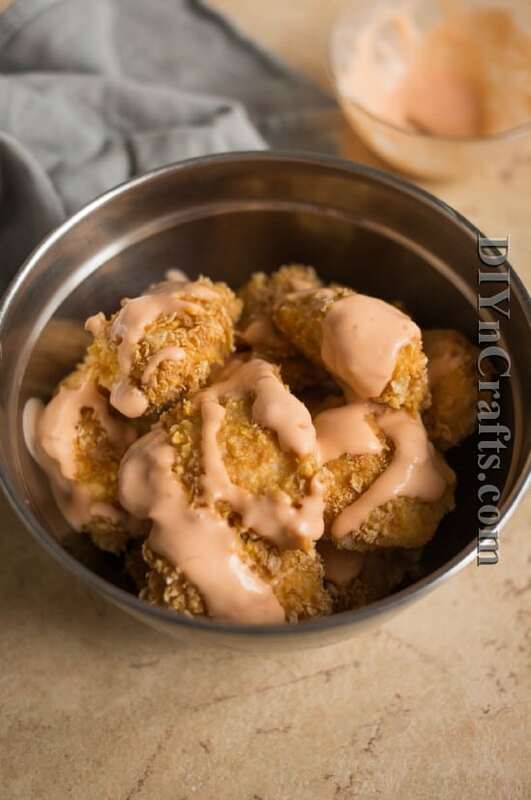 This is seriously the most delicious chicken appetizer that I think I’ve ever tried, and my entire family – even my picky eaters – loves it too! We love appetizers at my house. I mean, why should you have to go out to a fancy restaurant to get a delicious appetizer? Why should you have to shell out about $20 each for those appetizers when you can make them at home, right? Well, let me tell you, this chicken recipe is going to knock your socks off. Seriously, this instantly became a hit at my house and my kids are already asking me when I plan to make it again. They actually did the same thing with these healthy zucchini tortillas. My kids are huge fans of delicious appetizers, too! So, this recipe only takes about 40 minutes from start to finish and the finish really is the bomb. Buttermilk, Corn Flakes, and various herbs give it a wonderful flavor and the rice vinegar gives it a nice little kick. I’m telling you, the last time I was this excited about a new recipe was when I made this Easter Bunny cake and well, that’s just because he’s so adorable. 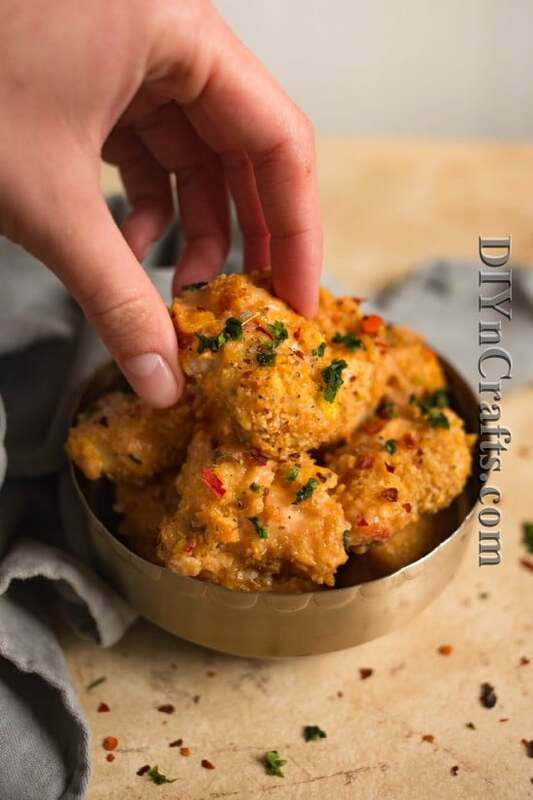 If you’re looking for a great chicken appetizer recipe that is easy and pretty quick – you only need 15 minutes to prep it – this is definitely one you should try. The flavor is unlike anything you’ve ever had and I’m sure that your family will love it as much as mine does. This will quickly become your go-to for an anytime snack or whenever you need a delicious and somewhat easy to make appetizer. 1. Preheat oven to 375 F (190 degrees C). 2. Prepare your dredging station by mixing flour with dried basil and garlic and whisking egg with buttermilk and a generous pinch of salt. 3. Season cubed chicken with more salt. Dredge in flour, dip into egg-buttermilk mixture and then coat with crushed cereal. 4. 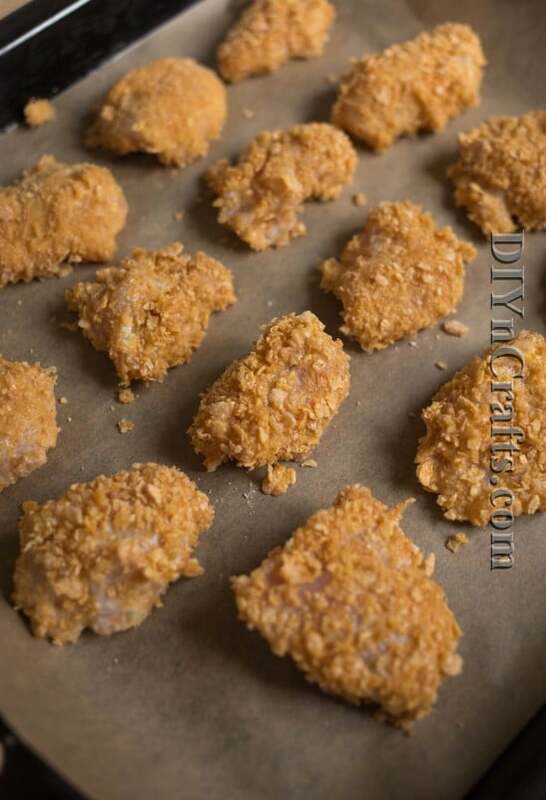 Place each piece onto parchment covered baking sheet and bake for 18-20 minutes. 5. Mix mayo with hot sauce, salt and vinegar. 6. While chicken is still hot, drizzle the sauce over and mix to coat each piece evenly. Serve immediately, sprinkled with more dried basil. Herbs, spices, vinegar and other ingredients give this chicken a real bang! Preheat oven to 190 degrees C (375 F). Prepare your dredging station by mixing flour with dried basil and garlic and whisking egg with buttermilk and a generous pinch of salt. Season cubed chicken with more salt. 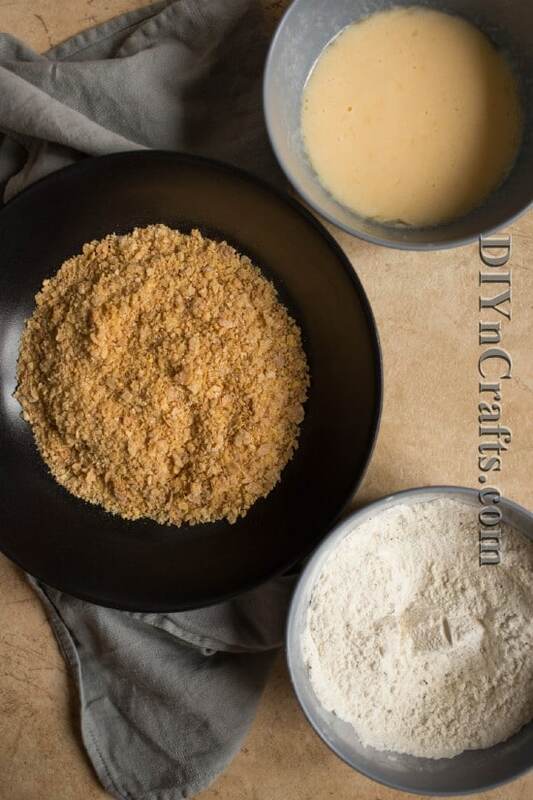 Dredge in flour, dip into egg-buttermilk mixture and then coat with crushed cereal. Place each piece onto parchment covered baking sheet and bake for 18-20 minutes. Mix mayo with hot sauce, salt and vinegar. 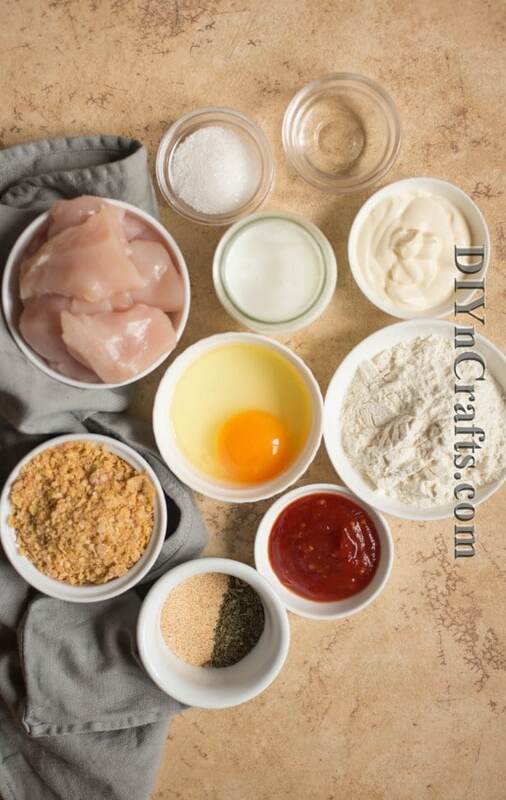 While chicken is still hot, drizzle the sauce over and mix to coat each piece evenly. Serve immediately, sprinkled with more dried basil.